Every time when you see orderly bookshelf, there is always stimulation in you that drives you to books. 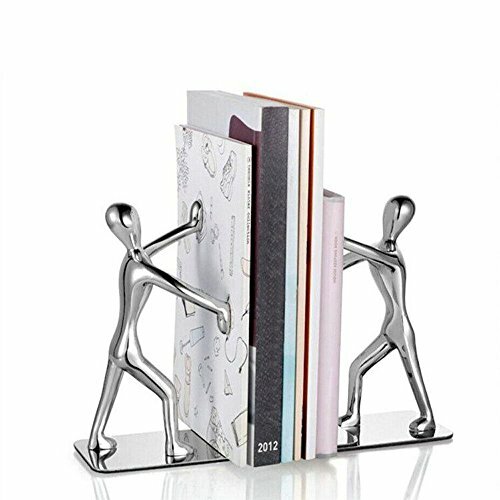 This set of bookends is one of kind due to its peculiar kung fu men design, doing tai chi to be exact. It keeps books vertically organized while presenting you with the deeply culture-related popular art. One stone and two birds. Since it is stainless steel made, it is rust-proof, anti-corrosion, durable and easy to clean. Also it is heavily set and stands stable. Size (LxWxH): 18.5 * 7 * 15.5cm /7.3"x2.8"x6.1"
EVA velvet paper affixed to the bottom to protect the countertops. A gift option for your book-loving friends, little kids and kung fu fans. If you have any questions about this product by Winterworm, contact us by completing and submitting the form below. If you are looking for a specif part number, please include it with your message.